This is the 25th newsletter! If you are enjoying it, could you do me a favor and share it? Help your listings reach a larger audience of local theatre lovers! Just click the "View this email in your browser" link and share the url! Time is rapidly running out to support the Ruthless Reciprocity project - and there is a new perk this available, but only until tomorrow! "If you give this week to Ruthless Reciprocity, you get your perk, plus your contribution goes towards landmark goals, which will allow awesome organizations that serve performing artists get FREE ebooks!" Learn more here. Get your tickets today for Steel Magnolias! From the article: It was two decades ago, in a small theatre in a downscale, Hollywood-adjacent neighborhood in L.A., that I first saw the work of Deaf West Theatre. It was a straightforward, and straightforwardly shattering, production of Marsha Norman’s ’Night, Mother, performed in what even then I understood was a well-worn, even tired convention: Deaf performers acted in American Sign Language onstage, while speaking actors in a sealed booth behind us quietly piped the dialogue into headsets for the hearing among us. Still, I was transfixed; as I wrote in a review at the time, Deaf West’s ’Night, Mother was “more beautifully crafted and moving than most hearing productions” of the play. Equal Weight is an original comedy about friendship, love, and learning to listen to that not-so-little voice in your head. This immersive, multimedia performance - which combines live theater with film - invites us into the life and mind of Zeke as he navigates his relationships and learns about the most important one of them all. The quirky, emotional, and frequently outrageous cast of characters bring the stage to life in a style that is sure to engage audiences of all ages. 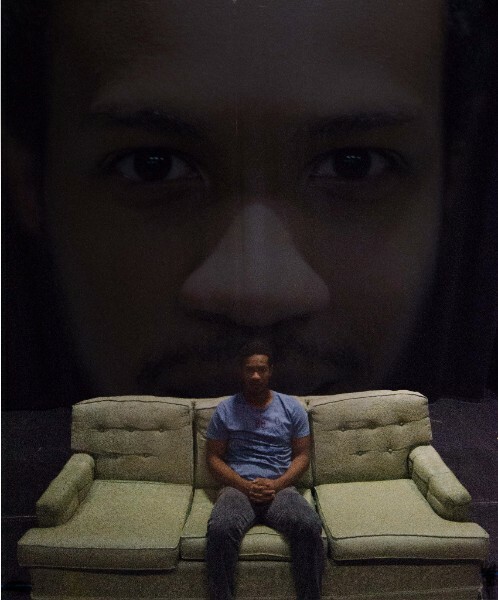 Khalil Flemming '16 writes and directs Equal Weight, which features set design by Lynndy Smith '17, costume design by Amir Hall '17, sound design by Thomas McPhee '16 of Hampshire College, and lighting design by Kathy Couch. More information about the Department of Theater and Dance at Amherst College can be found on Facebook or their website. J-ART returns for its 2015-2016 season with a spectacle you will have to see to believe! 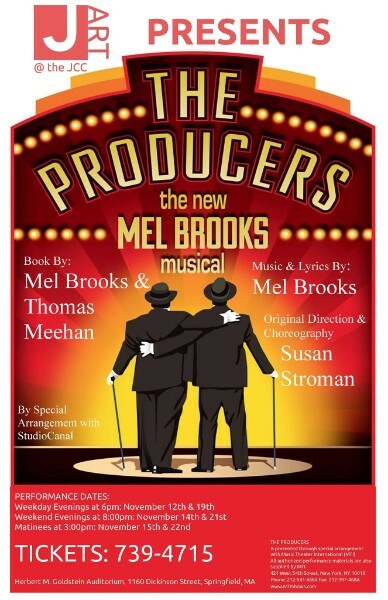 Mark your calendars, ladies and gents, The Producers opens this November! A scheming producer and his mousy accountant aim to produce the biggest flop on Broadway in Mel Brooks' laugh-out-loud spectacle. You've never seen The Producers like this! Experience the classic tale of 19th century family life in Civil War America like never before! Based on the novel by Louisa May Alcott, this glorious musical for all ages follows the adventures of aspiring author Jo March and her sisters on a journey of personal discovery, heartache, hope and everlasting love. With joyful melodies, memorable characters and a tenderhearted message, come revisit the story you loved and the lessons you never forgot! For more information, see their website. For tickets, please call (413) 565 - 1307 or email. “The Fabulous Lipitones” is the next production in the 19th Season of plays at West Springfield's Majestic Theater. 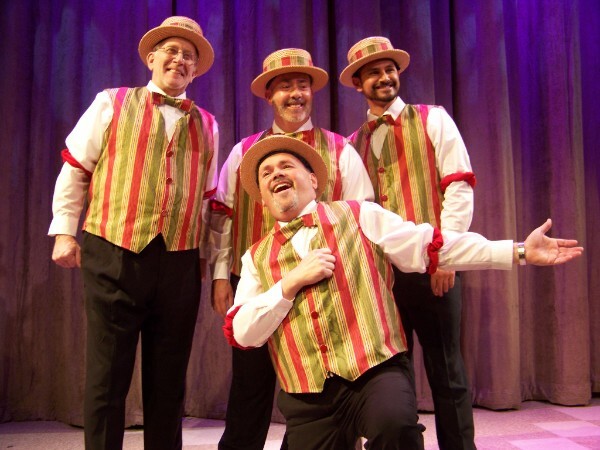 The musical comedy by John Markus and Mark St. Germaine follows the story of The Lipitones, a barbershop quartet from rural Ohio. When the lead singer suffers a fatal heart attack while holding the final note at a competition, the remaining members must find a replacement or give up the avocation that's been part of their lives for the past thirty years. The sole candidate at the audition is a mechanic who is twenty years younger than the group, wears a turban, carries a ceremonial dagger and goes by the name of “Bob,” short for Baba Mati Das. With that, the group finds a terrific new singer, and learns to co-exist with someone from an entirely different culture. 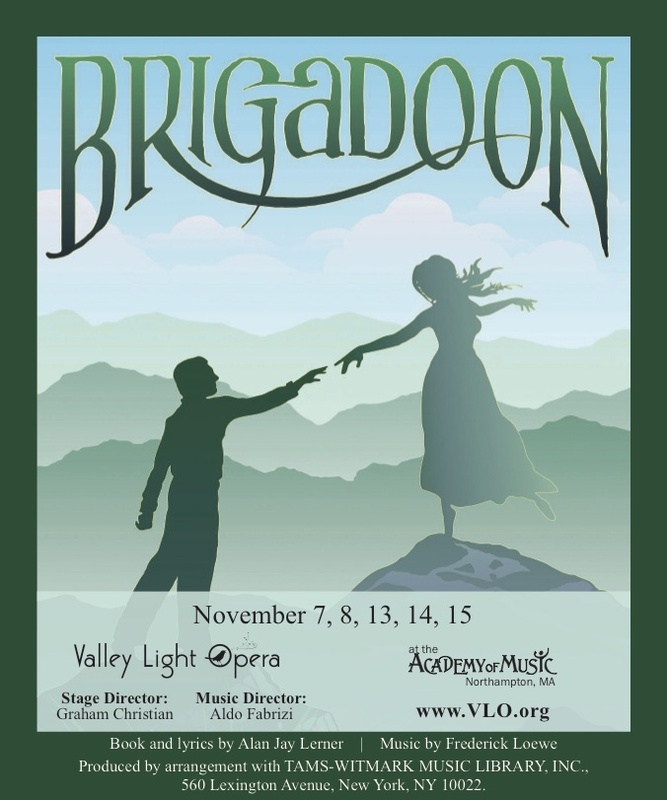 The play runs October 29 through December 6. Tickets can be purchased by contacting the box office at (413) 747-7797. For more information, visit the website. Treacherous, power-hungry, untempered by moral restraint, and embittered by physical deformity, Richard, the younger brother of King Edward IV, is ablaze with ambition to take England's throne. 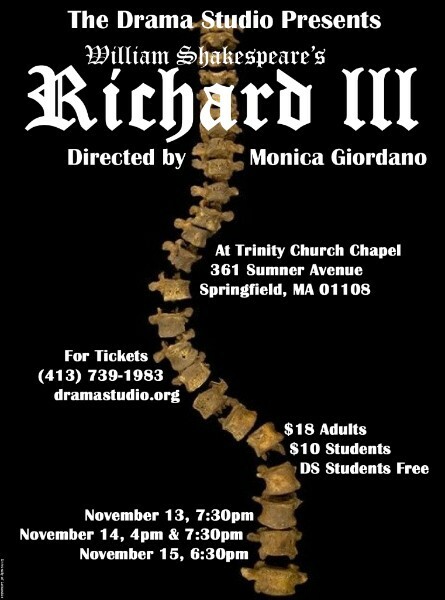 Richard III is Shakespeare's chronicle of Richard's machinations to be king, a tale of murder upon murder. Richard engages in formidable confrontations with a large cast of characters, almost all of them caught up in the terrible struggle for power that dominates the play. While producing Shakespeare certainly isn't new to us at the Drama Studio, Richard III will be our first foray into his history genre. Before there was Game of Thrones there was Richard III! 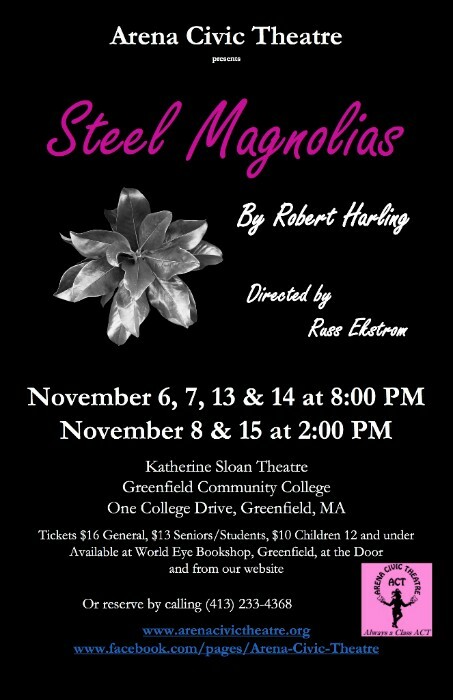 $18 Adults, $10 Students, Drama Studio students Free. Parking is available in Trinity's lot. (413) 739-1983 for Tickets. More information on the website. All-new comedy show featuring improv comedians The Ha-Ha's performing "Shrink: Where Freud Meets Funny" and special guest "Foiled: The Improvised Two-Man Musical." Saturday, November 14. Arts Block Cafe (289 Main St., Greenfield) at 8:00pm. (Doors open at7pm.) Tickets $13 at the door or $10 in advance online. For more information, call 413-774-0150. John Sheldon, long-time Serious Play! 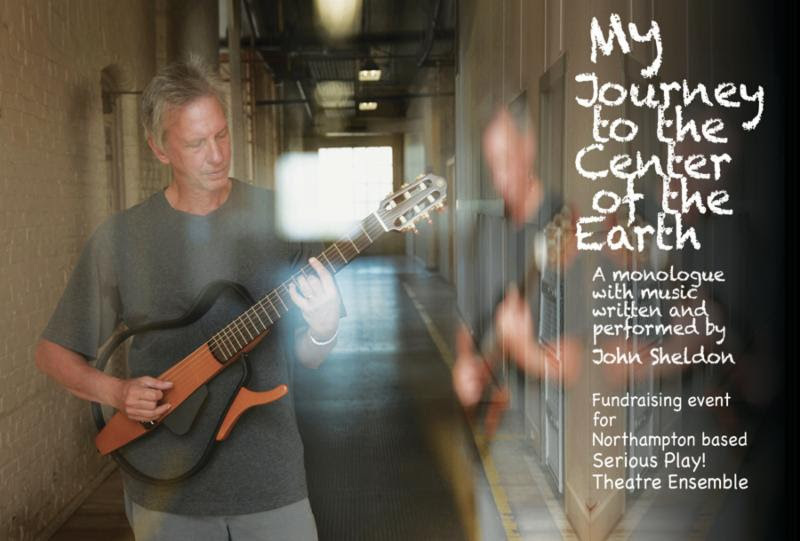 collaborator, is bringing his dramatic monologue with music to Northampton - for the first time - as a fundraiser for Serious Play! Theatre Ensemble. The three Journey performances are the highlight of - the sendoff for - our annual year-end fundraising. Join us to experience John Sheldon's masterful storytelling with music - and to help support the art of ensemble theatre in the Pioneer Valley. Seating is limited, reservations recommended! $22 reserved tickets, $25 at the door. Reservations online or by calling 1-800-838-3006. Adapted by Division III student Xingying Peng from the novel by Eileen Chang, Love in a Fallen City tells the story of Liusu, a woman who is being pressured by her family to return to her deceased husband’s household and perform the traditional duties of a widow. She meets the spoiled British-born Chinese man who was originally intended as a match for her sister. Their relationship takes a sharp turn as the Sino-Japanese war falls on China. 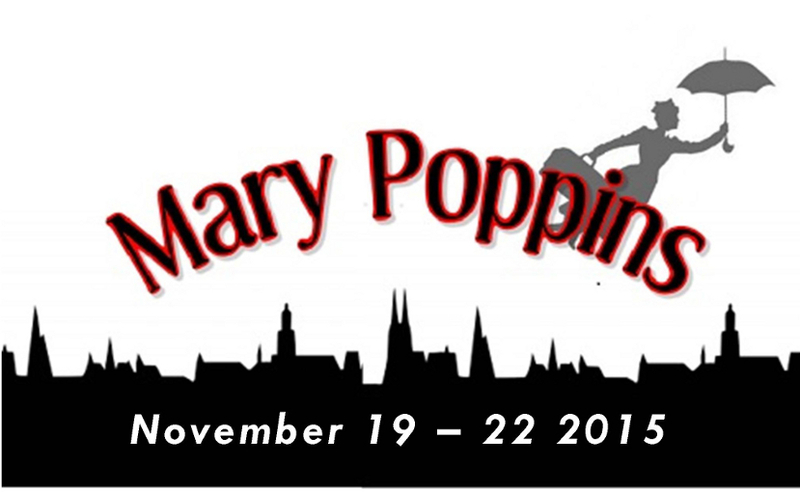 St Michael’s Players of East Longmeadow is gearing up for their autumn production of “Mary Poppins”. The show contains many familiar songs like “A Spoon Full of Sugar”, “‘Supercalifragilisticexpialidocious” and “Chim Chim Cher-ee”, all performed by our all local cast. 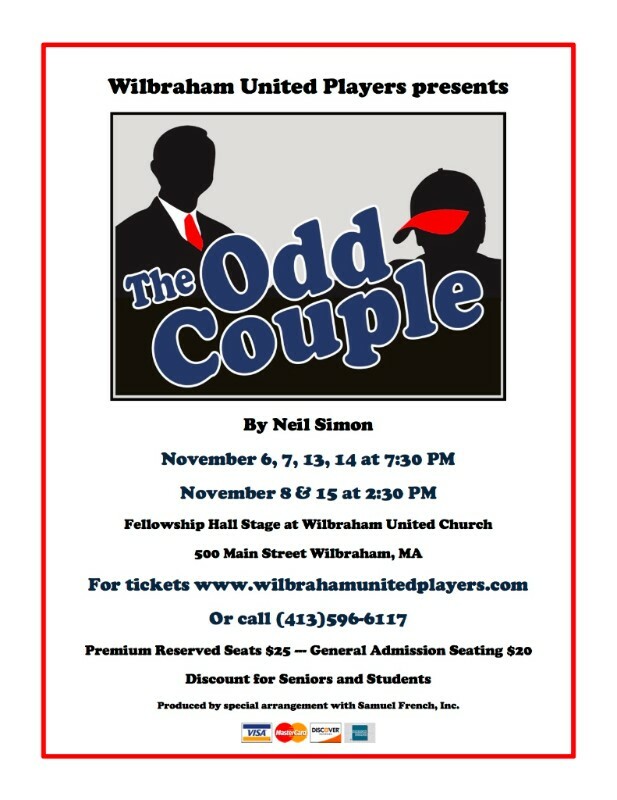 Performances will be held Thursday, Friday and Saturday November 19, 20 and 21 at 7PM, and Sunday November 22 at 2PM, at St. Michael’s Community Center, 53 Somers Rd East Longmeadow. Tickets are available at stmichaelsplayers.com. 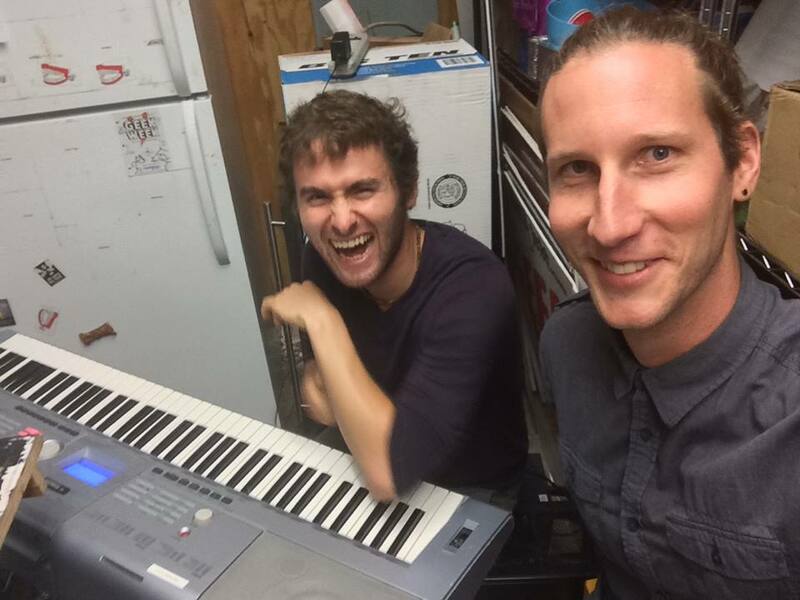 Monthly improv jam and show open to all. 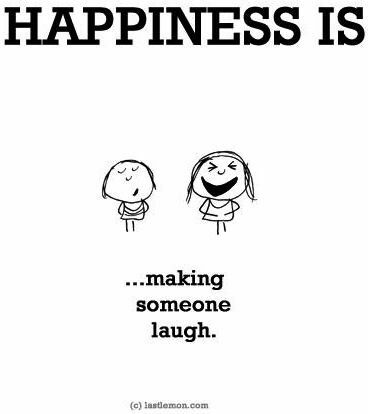 Come improvise with and watch some of the Valley's premier improv comedians. Last jam of the year! Sunday, November 22. Arts Block (289 Main St., Greenfield, MA) at 7:00-8:15pm. Tickets only $5 at the door. More info online or 413-658-4615. Black Cat Theater is preparing for their Spring production of Disco Inferno, directed by Dawn Larder (artistic) and Greg Williams (music). 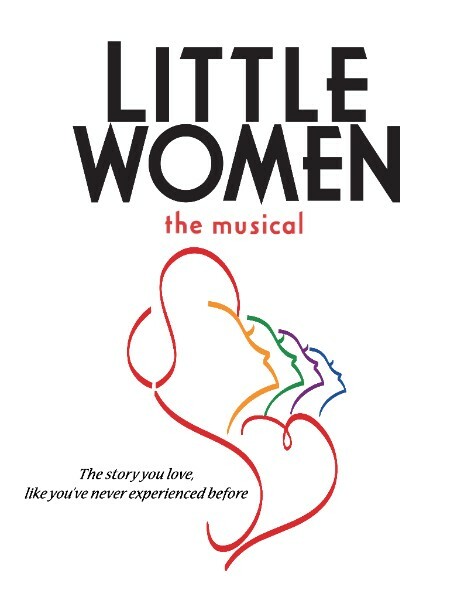 Auditions for this primarily youth-cast show (ages 10 and up please) will be held on Monday, November 16th & Thursday, November 19th at 6:00 pm in the South Hadley High School Auditorium. All candidates under the age of 18 must be accompanied by a parent/guardian. Applicants should bring with them a short write-up of previous theater experience and be prepared to perform a short musical piece. We will have a CD player and a cappella is also an option. All auditionees will learn a simple choreography movement so please dress prepared to move. Time permitting, there may be readings from the script as well. In Disco Inferno, the story of Faust is brought to life in an explosion of hit 70’s songs, high energy dance routines, and glitter-ball spinning action. Jack is an aspiring musician who wants nothing more than to be famous, so signing away this thing called a soul is a small price to pay. But Jack soon finds all that glitters isn't gold on the other side, especially if you're all out of love. Disco Inferno is scheduled to be produced at South Hadley High School April 14th-17th. Rehearsals will be on Monday and Thursdayevenings from 6:00-9:00 pm starting January 21st. If unavailable to be seen in person, please call 413-563-6023 or email. The Facebook event is here. creative musical production for students in grades 9-12. January for the staging of the show in early March. music. The specific musical will be determined by the team of educators. gender identity, disability, religion or sexual orientation. Monday, November 30 at 6:30 PM at the Bangs Community Center (70 Boltwood Walk, Amherst, MA 01002) Callbacks will be by invitation only Thursday, December 3 at 6:30 PM. An angsty rock musical adaptation of the seminal play about the trials and tribulations of growing up. 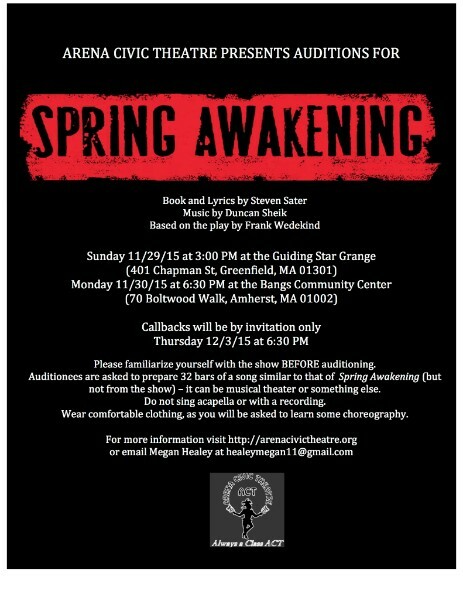 The winner of 8 TONY Awards, including Best Musical - told by Duncan Sheik and Steven Sater through "the most gorgeous Broadway score this decade" (Entertainment Weekly) - Spring Awakening explores the journey from adolescence to adulthood with poignancy and passion that is illuminating and unforgettable. The landmark musical is an electrifying fusion of morality, sexuality and rock & roll that is exhilarating audiences across the nation like no other musical in years. For more information about these auditions and what to prepare, please see the Facebook event. Rehearsals will be held primarily in the Greenfield and Amherst areas. Performances will be at The Ruth B. Smith Auditorium at the Orange Town Hall On April 22, 23, 24, 29, 30 & May 1 of 2016. This month, join us in Greenfield! Please help spread the word and add your company members and colleagues to the guest list on Facebook. More information on their website. Open to all levels of players - from beginners to experienced, this day-long intensive workshop dives deeply into the improvluscious waters of the Zen of Improv. We'll fully immerse ourselves in this uniquely natural and self-affirming approach to improvisation. We practice learning how to be more aware of the scene that's revealing itself onstage and following where the scene wants to go...while letting go of the need to work so damn hard and "make stuff up." Register online. For more info, email or see the Zen of Improv page online. The sessions take place both in Double Edge's indoor training spaces and outside in the fields, hills, pond and pastures of the Farm. Intensives are open to participants of all levels of experience. For more information or to apply, see the website or send an email. We offer partial scholarships through the Timothy O'Brien Fund to emerging artists from underserved communities in our region.